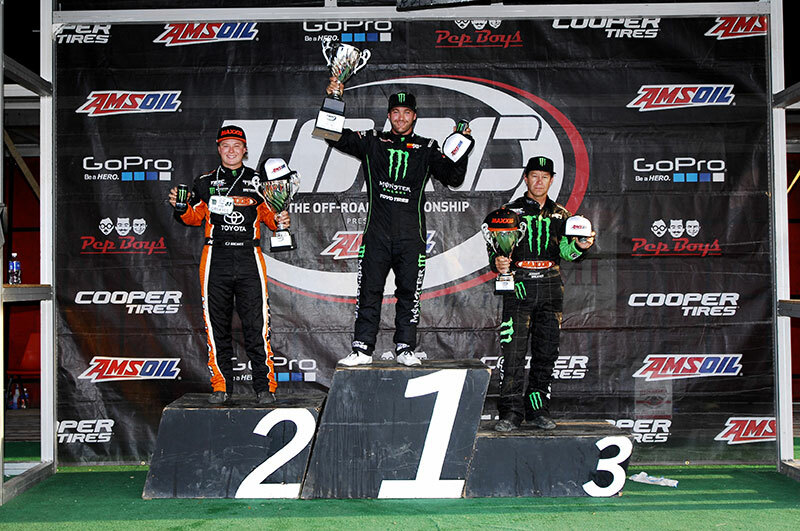 Johnny Wins 4th FCP Cup Race in Epic Father Son Duel, CJ Atop Pro4 & Pro2 Points. 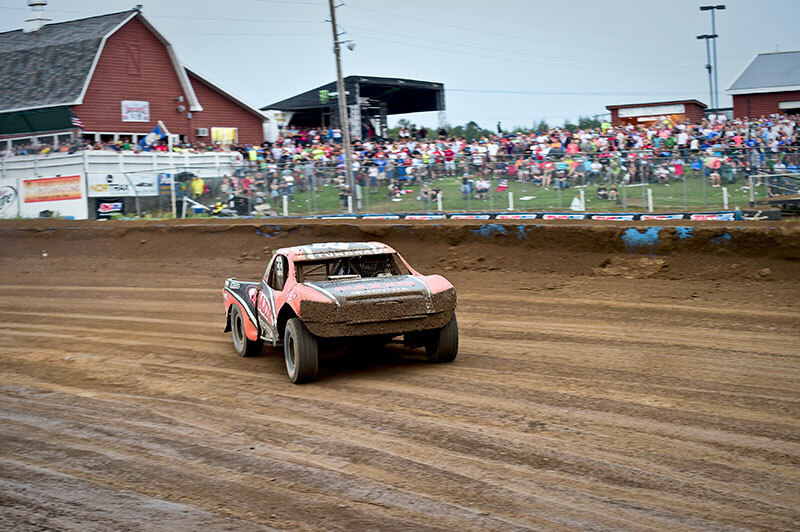 CRANDON, Wis. (June 28, 2015) — Crandon. 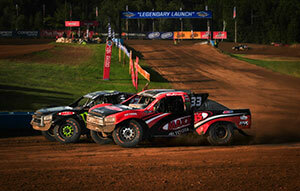 Without a doubt the most prestigious and most highly anticipated races of all off-road racing venues. 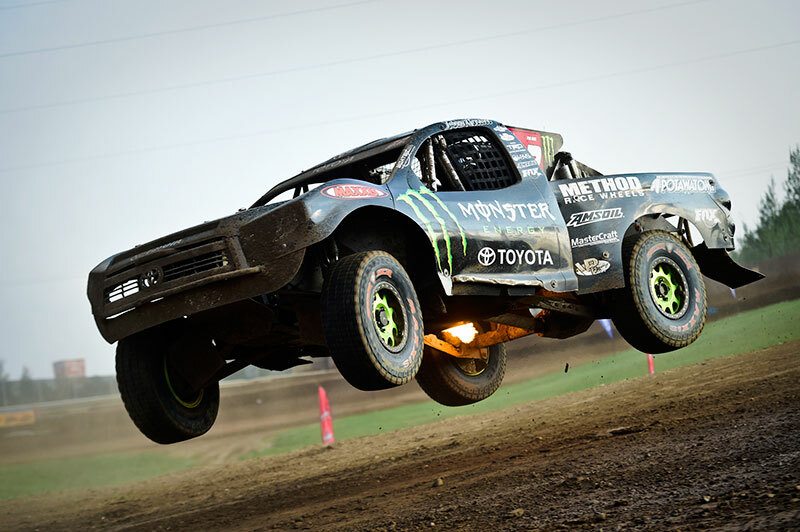 Large crowds, an incredible track, and fierce rivalries, make for some exciting racing action. 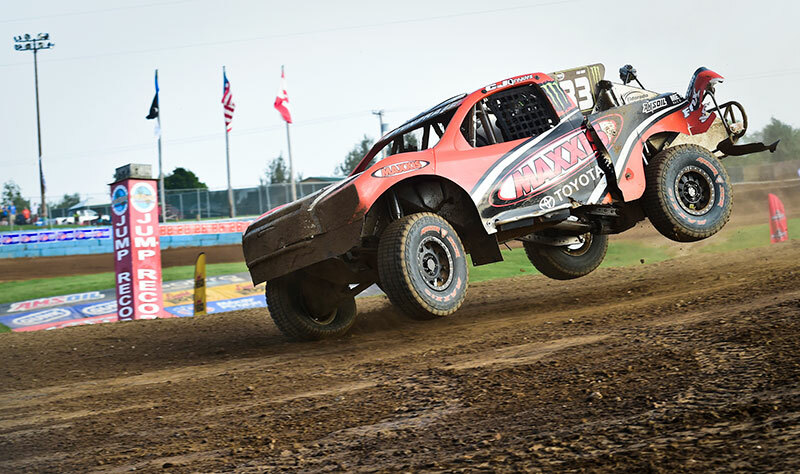 This year was no different as the Greaves Boys put on a show for the faithful at Crandon International Raceway in TORC rounds 7 and 8 and the Forest County Potawatomi Community Cup race last weekend. 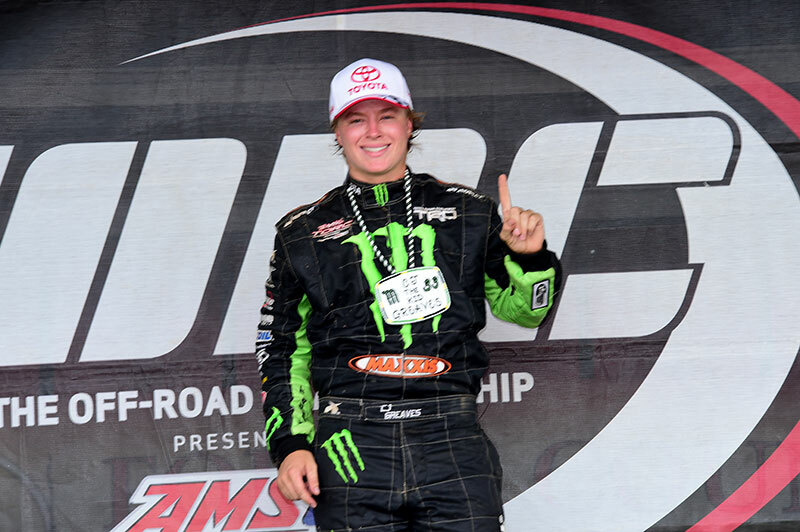 CJ Greaves walked away with more hardware and maintained his points lead in both Pro-4 and Pro-2 with a pair of 2nd place finishes in Pro-2 and a win and 2nd place in Pro-4. 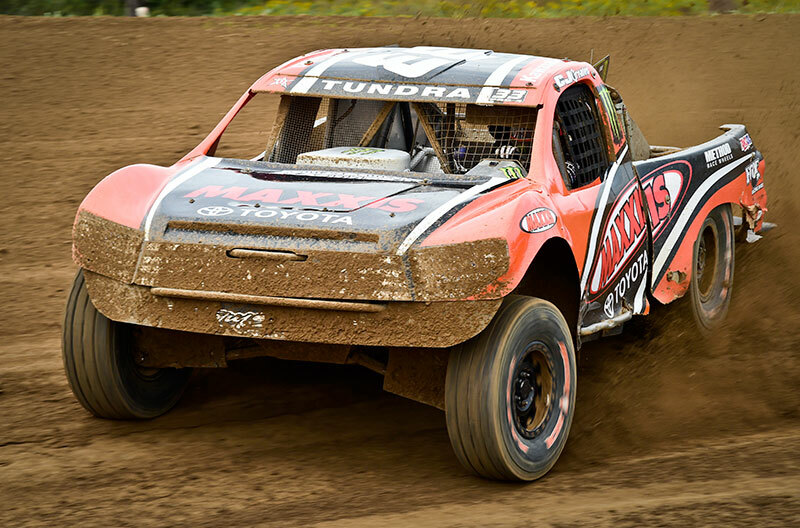 Johnny Greaves broke CJ’s Pro-4 winning streak with a win on Saturday but CJ pulled a late race pass on Sunday to knock the elder Greaves to a close 2nd place finish. 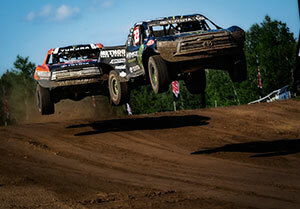 Johnny and CJ go side-by-side in Crandon. As always, the Cup race produced some nail-biting action as the Pro-2’s tried to take advantage of a 18 second head start to get to the checkered before the Pro-4’s could catch them. This would not be the case in this year’s race which is in its 20th year. 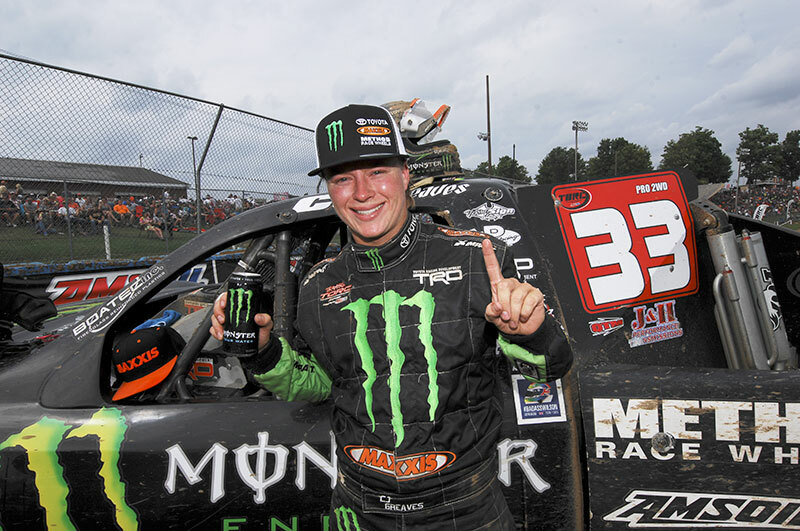 With 3 laps to go, both Johnny and CJ passed Keagan Kincaid, the leading Pro-2 truck, setting up a rematch of 2013’s side-by-side finish in which CJ took the win. This year, the roles would reverse. Johnny got the win with CJ door-to-door at the checkered flag followed by Chad Hord in 3rd. Kincaid caught fire and had to pull out of the race. 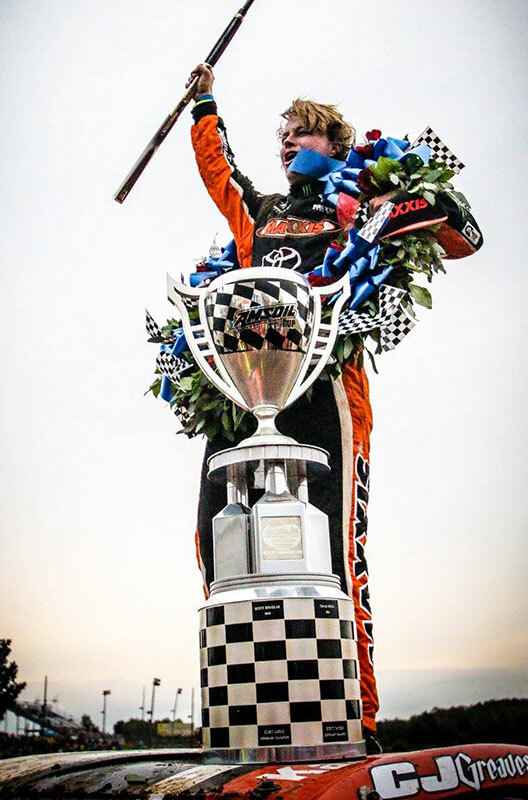 Saturday’s Racing Recap: Coming off an incredible 4 win weekend in Chicagoland, CJ was ready to keep the streak going. He qualified first in both Pro-2 and Pro-4. He was in 3rd following the famous landrush start and FC Potawatomi turn one behind Mittag and Kincaid. Mittag could not hold the lead however and went off the track in the hairpin turn on the back part of the track, loosing 2 positions. 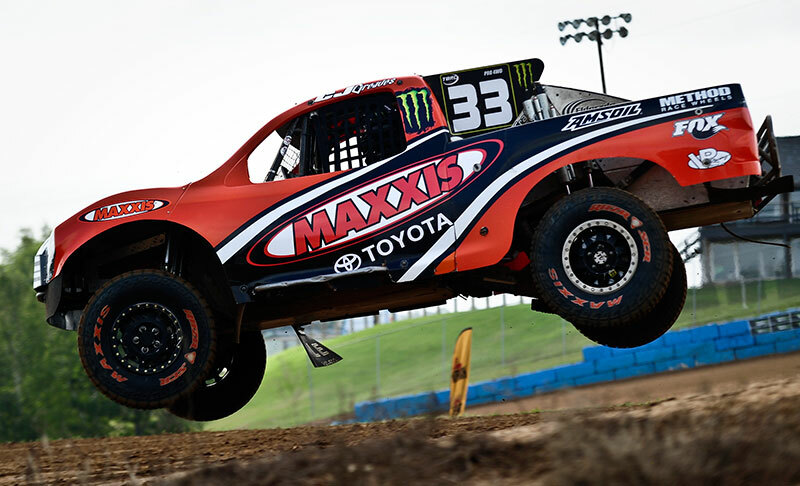 CJ made up some ground in his Monster Energy Maxxis Tire TRD Toyota following the competition caution but he could not pass Keagan Kincaid and settled for a 2nd place finish. 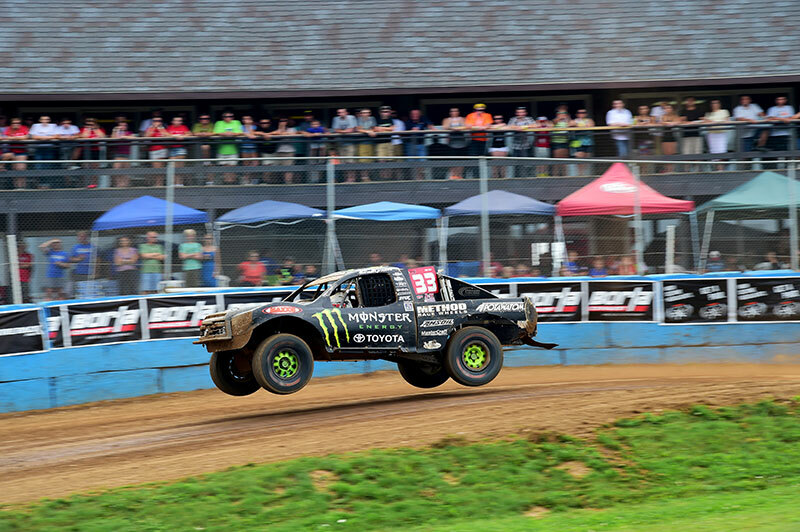 CJ Greaves leads the field through FCP Turn One in Crandon. 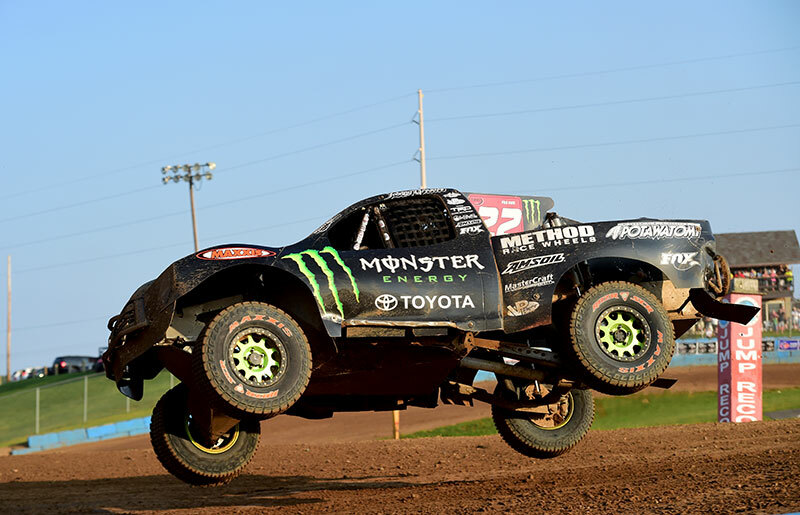 CJ got the holeshot in his number 33 orange and black Maxxis Tire Monster Energy Method Race Wheels Pro-4 but Johnny Greaves got the best of him in the gravel pit turn in his number 22 Monster Energy Pro-4. Chad Hord and Adrian Cenni lost it on the backstretch hairpin making it an all Greaves Family show. CJ almost made the pass on his dad several times. Finally, on the last lap, CJ was able to pass momentarily but the elder Greaves battled back to take the lead and the win by a tire’s width! And speaking of tires, Johnny had a flat as he completed the race. “It’s pretty cool, number 1 and 2 going back to the same pit,” said CJ following the race. 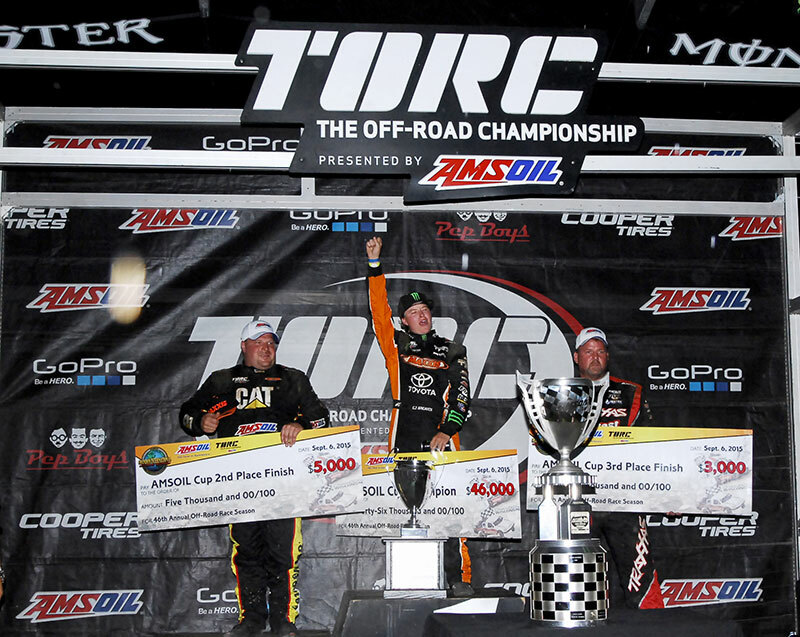 Sunday’s Racing Recap: The Pro-4’s were up first on Sunday. Johnny emerged as the leader following the landrush start. Chad Hord was in 2nd but CJ passed him at the exit of the gravel pit turn. Douglas also made the pass for 3rd. Johnny and CJ check out to a nice lead which they hold until the competition caution. Johnny Greaves receives pressure from CJ Greaves in Sunday’s Pro-4 action. 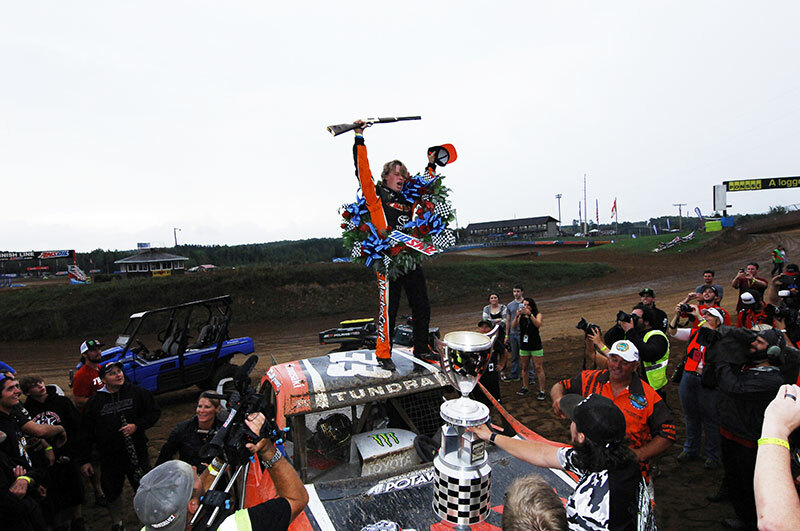 On the restart, Johnny and CJ pulled away from the field and put on a show for the Crandon crowd. They went side-by-side several times as they went around the 2.5 mile track. CJ finally made the pass on Johnny on the front stretch. He went on to win the race with Johnny coming in a distant 2nd. The win helped him maintain his points lead over his dad by a narrow 6 point margin. 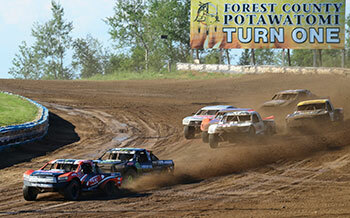 FC Potowatomin Community Cup: The 20th annual FCP Cup race was the final race of the weekend. The Pro-2’s compete against the Pro-4’s in a 10 lap shootout. 4 Pro-2’s lined up against 6 Pro-4’s. 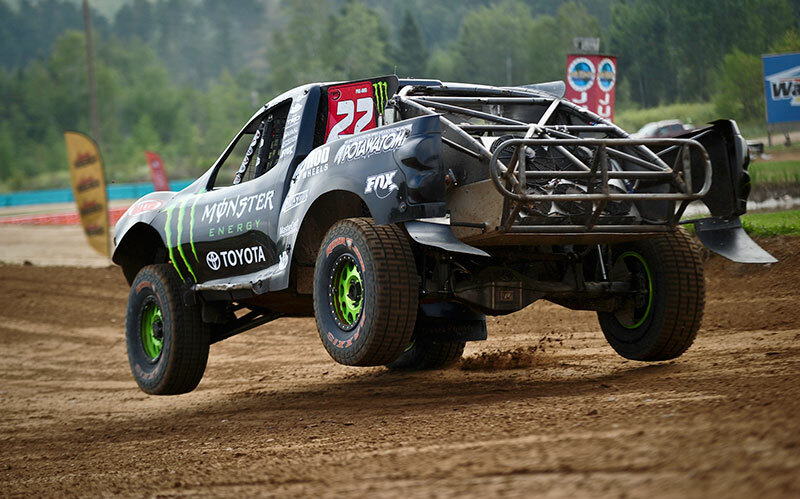 The 2-wheel drives got an 18 second head start. 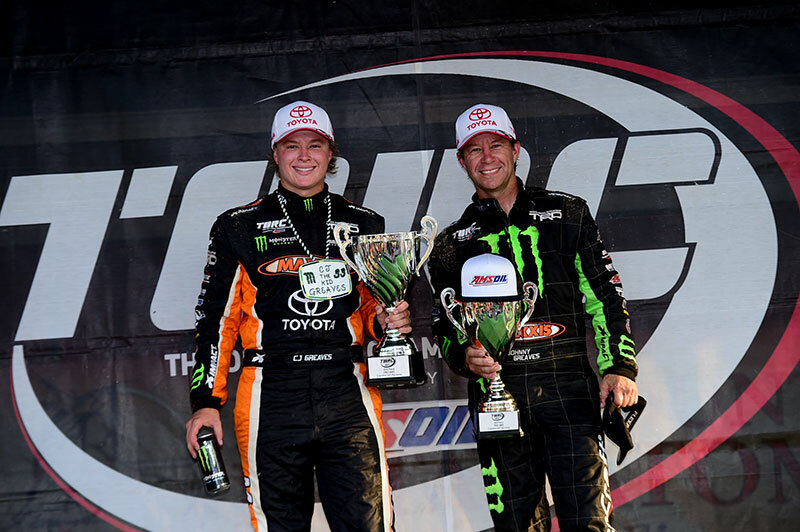 Both Johnny and CJ were drove in the Pro-4 class. 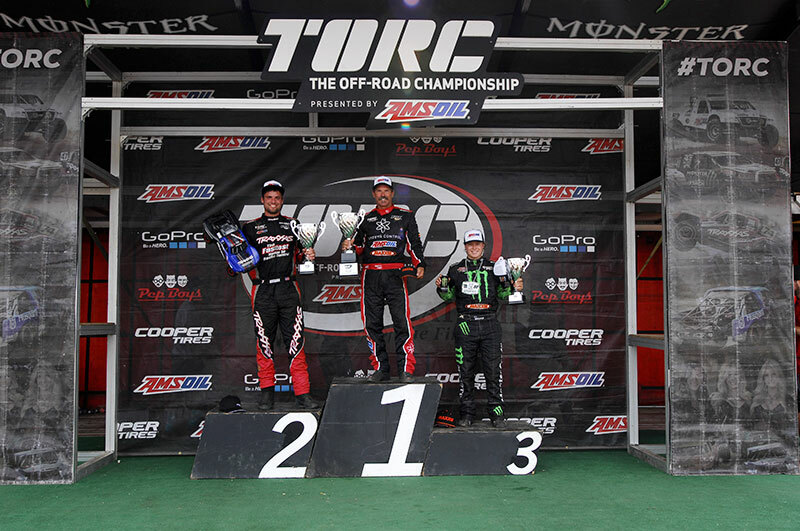 Marty Hart won the Pro-2 holeshot but Keagan Kincaid passed him in the argon turn as Hart went wide in the turn. Johnny got the Pro-4 holeshot with CJ close behind in 2nd. Johnny and CJ passed all the Pro-2’s and with 3 laps remaining, Johnny passed Kincaid, the leading Pro-2. CJ also passed him setting up an all Greaves dash to the finish. Kincaid ended up catching fire and had to pull out of the race. On the final lap, CJ began to pressure Johnny and passed him as the exited the gravel pit turn. Johnny battled back and passed CJ as the two slid into the final turn. Johnny nosed ahead to take the win by a narrow margin. This was Johnny’s 4th Cup win. Johnny celebrates his FCP Cup with with his son, CJ Greaves. 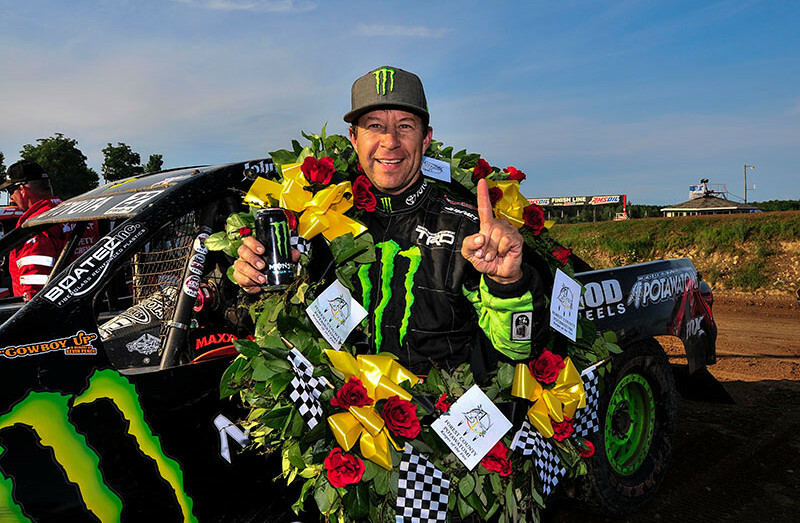 Johnny and CJ Greaves celebrated by standing on the top of Johnny’s truck and putting the famed flowered winner’s wreath around their necks. It was a classic father/son moment. 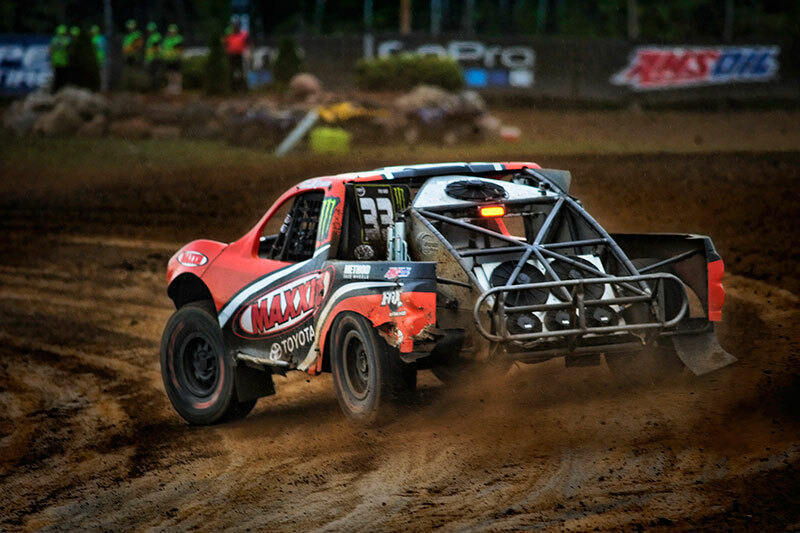 Greaves Motorsports will make the long trek East to the horseshoe shaped track at Charlotte Motor Speedway for rounds 9 and 10 on July 10-11.